Situated next to the Sutro Baths in one of the most beautiful parts of San Francisco, a Cliff House has been in operation since the middle of the 19th century. The Cliff House has gone through several architectural (and presumably menu) changes over the years, and it currently lives as an art deco mid-century throwback featuring the signature foods of San Francisco. 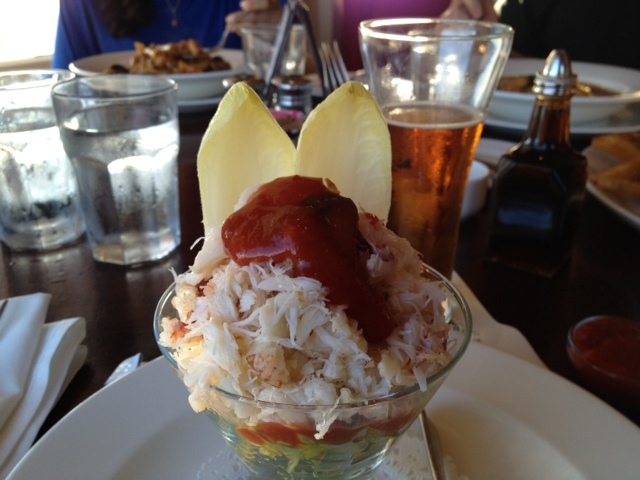 There are two restaurants in the Cliff House – the sophisticated Sutro’s and the casual Bistro. This recommendation is for the Bistro. There are no reservations at the Bistro, and the wait may take twenty to forty minutes, but fortunately there is plenty of bar seating where one can order a drink alongside a delicious appetizer. The dungeness crab cocktail ($15.95), artfully served in a martini glass, is sweet, flavorful, and satisfying enough for an entrée, and the prawn-pork potstickers ($13.50) are a beautiful blend of spicy and crunchy – using their accompanying dipping sauce is recommended. The French onion soup ($8.75), warm, soothing, and sweet, is another great choice. Once at the table, fresh sourdough bread is provided – so good my party usually ends up eating two or three baskets worth. There are also a number of solid choices among the entrees. The fish and chips ($18.50), made with the Bay Area’s famous Anchor Steam beer, is a classic Bistro dish and not to be overlooked. The spinach ricotta pine nut ravioli ($19.95), served in a tomato-pesto sauce with mushrooms, changes flavors – sweet, rich, tangy, and savory – with every bite, creating a sophisticated taste adventure that’s perfect for pasta lovers. For meat enthusiasts, the braised lamb shank ($29.00) is cooked tenderly on the bone and served with a fitting side of Israeli couscous. Vegan dishes are also available on request. Make sure to save room for dessert! The five desserts offered on the menu (all $7.25) are an excellent way to round out your meal. The sour cream fudge cake is rich but not overpowering, and the créme brulee is served flat and wide, creating the ideal ratio of crunchy crust to sweet interior. For visitors looking to capture the feeling of the historic San Francisco, the Cliff House Bistro is the perfect dining spot. The Art Deco architecture and signed photos of old movie stars catapult one back to the city of yesteryear. Try to get there in the evening – a delicious meal while watching the sun set over the Pacific coast is an unforgettable experience.